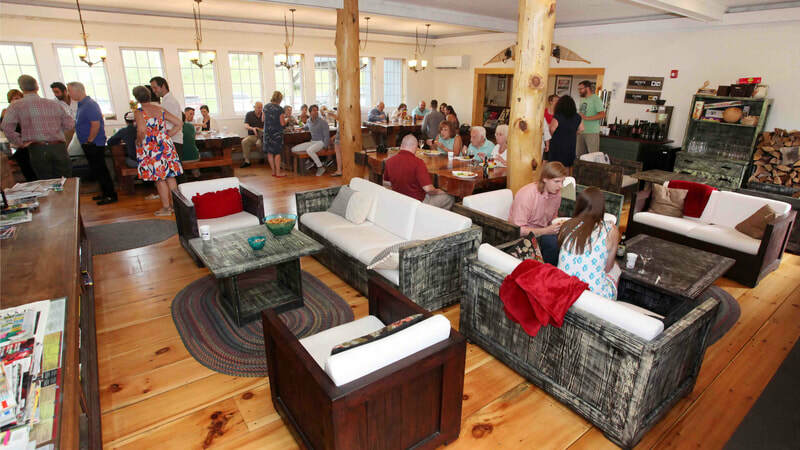 ​The Trailside Inn is perfect for special events, family reunions, leadership, and corporate retreats. The comfort of our spaces and the exclusive use of our property make for an unique and memorable experience for the groups that we host. Come unplug, relax, and recharge with us in Vermont! Just miles from Killington Ski Resort and overlooking the fairway of Vermont’s top-rated golf course, our up-style country farmhouse has everything you could hope for in your Vermont getaway. Our Inn has the cozy feel of a bed and breakfast with the capacity of a small hotel. Sleeping up to 100 people, our property is ideal for anyone seeking a destination event. Completely renovated, the 37 room Inn is finished with wide, white pine flooring and natural stone; antique pieces and one-of-a-kind barn wood tables. All of the warm natural wood touches add to its’ special atmosphere. Our rooms are simple and clean with complimenting common spaces, both indoors and out, to gather, hang-out and celebrate in. 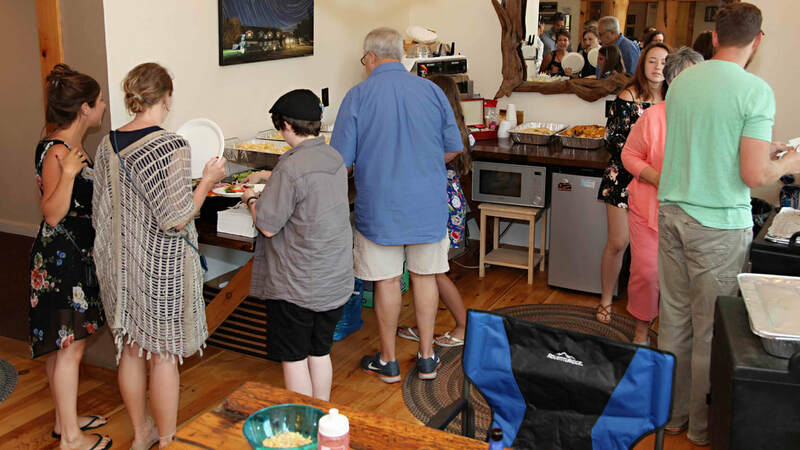 Hosting your group event at Trailside is like renting your own massive home! 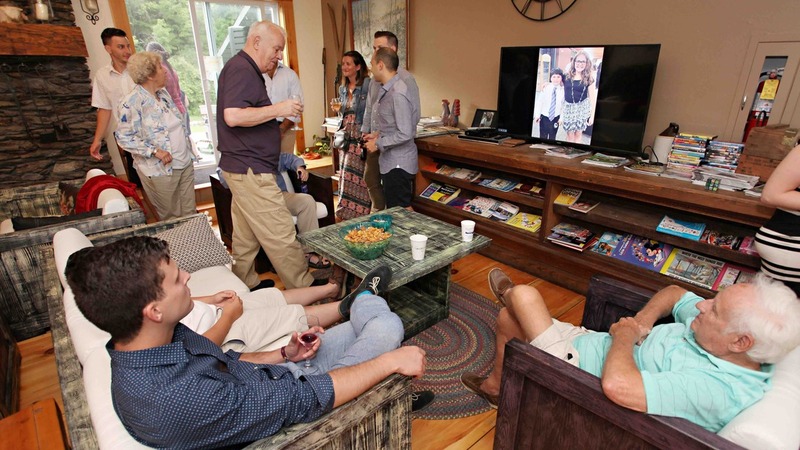 We love to work with groups to make the very most of your time in Vermont! group activities - evening bonfires, award winning golf and more! ​Pricing is built based upon: number of rooms used, season/time of year, onsite events held, and weekday vs. weekends. Depending on season and availability, we can accommodate smaller groups too! Please inquire for details. More reviews can be found on the Trailside Inn's The Knot, WeddingWire, and TripAdvisor page. We were just named Best of Wedding Venues on The Knot and only four venues in all of New England received this award! Outstanding service and hospitality! Above and beyond! Incredible experience at the Trailside Inn. The innkeepers were amazing! My company led a group on an adventure expedition and they supported us from start to finish ensuring our every need was met! From helping us with logistics and directions to ensuring our precise food needs were met, to even making sure we had all the resources available at the lodge to host a special team building event right there at the Trailside Inn. Josh and Ann went above the call of duty to the point that the 5 staff members and 29 student athletes that attended are ecstatic to get back. 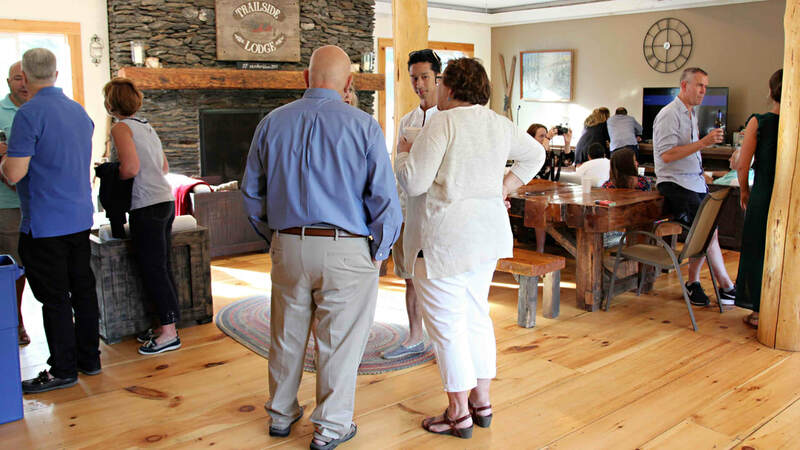 I look forward to leading future adventure leadership group programs in the Killington Area and for certain will be staying at the Trailside Inn! The Trailside in was great. It was perfect for our family reunion! It fit all 55 of us very comfortably and the rooms were great. The bathrooms and the showers were nice and I really loved the rustic wood floors and decor. The great room was perfect for larger gatherings and card tournaments. The yard was great for the kids to play outside and various lawn sports. Having a fire-pit with chairs was also great! The Trailside Inn was a perfect home-base for our large group's ski trip. The room and common areas were really clean and comfortable, making it easy to feel at home. I'm a big fan of the fireplace, local breakfast, and the sledding hill! 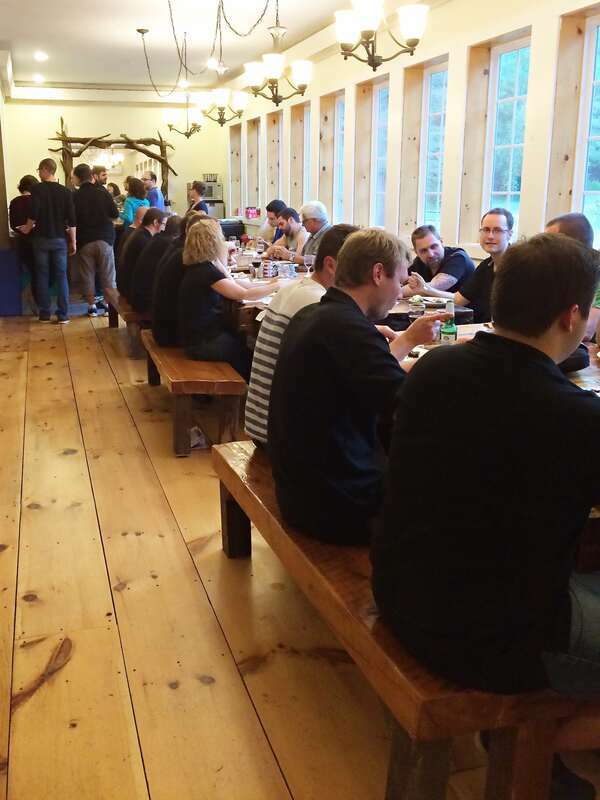 ​We brought around 40 team members onsite to Trailside in July and had a blast over three days! Josh and Ann were not only welcoming and hospitable, but very patient with our large group! Everyone really felt at home at the inn and had a great time relaxing with yard games, BBQing and evenings in front of the bonfire. Killington as a whole also offered really great group outings (Breweries, trips to the top of the mountain, navigational courses, etc.). We will definitely be returning! ​I came with my entire company, and we had the best time! The rooms were clean, the main area was perfect for hanging out, and the basement was a great place to play some pool and let loose. I had such a fun time sitting by the fire, sledding on the golf course, and just hanging out. Thank you for being such wonderful hosts! Thanks to Josh and Ann, they did everything they could to welcome our group and ensure that our three day event event was a success. The Trailside Inn rooms were great, and the meeting facilities and common areas were clean and comfortable. This is a great place to stay and perfect to host large groups, we will definitely be coming back again! ​I came here on a company outing and it was a great place. It was very clean and well kept. The innkeepers were very pleasant and accommodating. There's also a games room for those that enjoy board games, foosball and pool. It's one of the best places I've stayed in and made for a great first experience in Killington, VT! ​We hosted a family reunion at Trailside for 4 days and 3 nights. Josh and Ann, the innkeepers, could not have been more accommodating and were consistently available throughout! The Great Room, big back deck, and lower level game room provided numerous options for gatherings throughout our stay. The setting is so casual and perfectly consistent with a getaway in the Green Mountains. The provided breakfast has a delicious local flair. ​So spacious, so many rooms, layout of common area, basement, and rooms was perfect for a huge company outing and lots of fun. Pool table, foosball table, etc are great additions for activities. Great for big events! Great family reunion place! Our family of 35 stayed at the inn last August. Josh and Ann made us feel right at home! They were very attentive to our every need including building us great bonfires each evening and ensuring that we had plenty of towels. We occupied the barn and loft which were great for big groups (they are self contained apartments and the barn has a great room which was a bonus) as well as a couple of dorm rooms which were great for families with young kids. Between the game room, living and dining areas at the main inn and the outdoor space we had plenty of room to spend time together. We played games, sports, cards and even ventured out to a great indoor rock climbing place that Josh and Ann recommended. There was no time to be bored and the use of the dining room at the main inn gave us a place to eat as a family. The inn was clean and well maintained and well, comfortable. What a great vacation! Thank you Josh and Ann for EVERYTHING.